There is a great deal of variety amongst wasp species here in Georgia. Yellow jackets, mud daubers, and hornets all fall under the category of wasps, but each has their own unique behaviors that set them apart. If wasps are around your home, it is imperative that the exact type of wasp can be identified. But why does it matter what type of wasps are around your home? The truth is, there exists no “One size fits all” approach to pest control. Different treatment strategies and products impact different types of pests in varying degrees. As such, the most effective pest control treatments take into account the type of pest, its unique behaviors, and the conducive conditions that allow it to thrive. Wasps are no exception to this general principle. With over 30,000 identified species, there exists a great deal of variety in wasp behavior patterns and lifestyles. That being said, the biggest divider is between social and nonsocial wasps. The vast majority of wasp species are solitary creatures, but the small minority of social wasps (About 5,000 species) are those most commonly encountered by homeowners. These eusocial species are members of the taxonomic family Vespidae, which includes yellow jackets and hornets. Even though social wasp species are in the minority when considering wasps as a whole, they are still numerous and diverse. This can make it difficult to identify individual wasp species. That said, there are a few tips that homeowners can employ to more easily identify the type of wasp that they are dealing with. Social wasps are nest-builders. They establish colonies that have a hierarchical structure centered around the queen. Worker wasps will forage for food, tend to the young, and expand the nest over time. Some species of wasps can have thousands of members in an individual colony. Wasps of all kinds tend to prefer to nest in secluded areas away from where homeowners might notice them. Some species, such as European hornets, will nest in high altitude areas such as tree branches, underneath roof eaves, or beneath gutters. In some cases, wasps may even build nests in corners of garages, basements, or other rooms if they are left unattended. Not all wasps nest in high altitude areas, however, with some building subterranean or low ground nests. Yellow jackets are commonly found in holes, inside tree hollows, or in wall voids. They may also nest beneath porches or in other dark, secluded spaces. These pests are distinct from hornet species, which often have fully exposed nests. The easiest way to find a wasp nest is often to follow workers to an area of increased wasp activity. If you are seeing an unusual number of wasps in an area (more than one or two) odds are the nest must be nearby. That being said, homeowners should be very cautious when approaching an area of high wasp activity, as they can be very aggressive in defending their nesting sites. Wasp nests vary in shape and size depending on the species. But the most common distinction is in shape. If the nest is fairly large and oval shaped, it is most likely a type of hornet nest. Other species build more irregular shapes. For example, paper wasps build an “upside down umbrella” shaped nest, which consists of a stalk attached to the ceiling from which a collection of hexagonal cells hang from. Mud daubers, another common wasp pest here in Georgia, are known to build nests that consist of interconnected “tubes” of varying lengths. While nest shape and location alone cannot distinguish some wasp species from others, it will help you to identify the general category of wasps that are active in and around your home. Beyond nesting location, wasps also vary in their activity. Different species will be seen at different seasons and at different times of the day. Some wasps, such as yellow jackets, primarily hunt during the day. 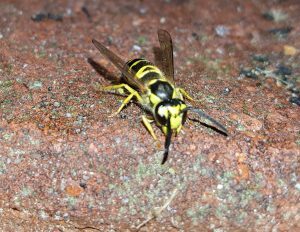 Other species, such as European hornets, the largest species of wasp active in the US, are known to forage in the evening. Wasps have a varied diet, but most will engage in some form of predatory behavior to supplement the nectar that they gather for the queen. European hornets, in particular, are known to feed on a variety of pest species, which can make them a beneficial neighbor in some cases. Though wasps vary in their behavior and nesting locations, most are aggressive defenders of their nests. For this reason, homeowners should be very cautious when approaching wasp nests. This is particularly true during the late summer, during which time wasps become significantly more aggressive. This occurs because worker wasps, finished with their gathering tasks, begin to overindulge on gathered nectar. The wasps become intoxicated due to this and will be much more likely to sting a person or pet that comes into their proximity. Wasps are an extremely varied group of pests, but they share one common trait: you do not want them near your home. Wasps can be a nuisance and a danger due to their aggressive nature in defending their nests. Due to the risk that they can pose, it is often best to leave wasp nest removal to the professionals. A trained technician has the skills and equipment necessary to remove a wasp nest without undue risk, which can save you a lot of time, expense, and frustration in the long-run. 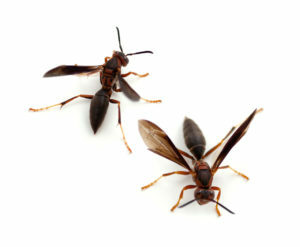 At Canton Termite and Pest Control, we have decades of experience dealing with wasp infestations of all kinds. We perform treatments at an industry-leading standard of service, providing you with the affordable pest control that is safe, effective, and reliable! So if you are dealing with wasps or any other pests, call us TODAY at 770-479-1598!